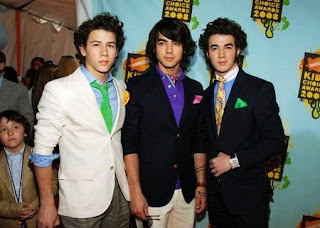 Jonas Brothers are set to perform at Nickelodeon's Kids' Choice Awards 2009 in Los Angeles March 28 and will again compete in the Favorite Music Group category, reports People. They ill also participate in a contest called Nickelodeon Kids' Choice Jonas Jam Sweepstakes. Nick dished: 'Our fans are the most important thing to us. Kids' Choice is all about fun.' Kevin added: 'We were almost slimed just by getting hugged by last year's host Jack Black. Maybe it's our year. We'll have to see. 'Two winners of the Jonas Jam Sweepstakes will get to accompany the boys down Orange Carpet in addition to a four-day trip to LA, $1,000 cash, a limo ride and tickets to the show and four tickets to a Jonas concert. This Kids' Choice star-studded lineup also includes host Dwayne 'The Rock' Johnson, Zac Efron, Hugh Jackman, Robert Pattinson, Amy Poehler, Reese Witherspoon, Miranda Cosgrove and Nat & Alex Wolff.